CEBU CITY (Updated) August 20, 2013 -- Capitol officials declared Cebu Province under a state of calamity on Monday to deal with oil spilling from a passenger ferry that sank Friday night off Talisay City. In approving its resolution, the Provincial Board (PB) authorized Cebu Governor Hilario Davide III to use P30 million in calamity funds to help contain the oil spill and assist the affected fishermen. 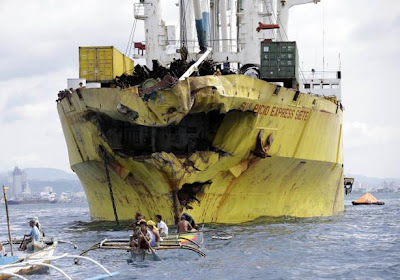 At least 750 survived the collision of the Sulpicio Express Siete cargo ship and the M/V St. Thomas Aquinas. Fifty-six were confirmed dead on Monday, with 13 more bodies found near the accident site near the Lauis Ledge. As the search continues for 64 persons, local officials in Cebu are trying to deal with the oil spill, which has reached points 15 kilometers away from the scene of the accident. The spill threatens about 5,000 hectares of mangroves and the livelihoods of fishermen in Cordova town and Lapu-Lapu City. It has also forced resorts in Mactan to close their beaches to swimmers. Cebu Archbishop Jose Palma, who is in the United States for some conferences, said he is offering his prayers for the victims, survivors and their families. The Cebu Provincial Board (PB) approved Monday the resolution to declare the whole province under a state of calamity in order to speed up the release of funds. “We cannot access the (calamity) fund if it is only Talisay and Cordova (where a state of calamity is declared),” PB Member Peter John Calderon said, answering a suggestion of his colleague Raul Alcoseba. The spill, he added, “might reach other towns, north or south, depending on the currents, so there is a need to declare the whole province a state of calamity,” Calderon said. Calderon and PB Member Thadeo Ouano, a former mayor of Mandaue City, drafted the resolution. Vice Governor Agnes Magpale said they decided to act right away on the declaration, especially since they won’t convene next Monday, a public holiday. Governor Davide said he has assured Cordova Mayor Adelino Sitoy that the Province will assist his town. The Cordova Municipal Government, also on Monday, placed 12 barangays under a state of calamity because of the oil spill. Mayor Adelino Sitoy said P1.5 million from the town’s calamity funds will be released to provide rice for about 5,000 people. “We can only provide them with rice. We cannot afford to give financial assistance,” Mayor Sitoy said in an interview Monday. He said he also asked a representative of 2Go to help the fishermen’s families. In Cebu City, Vice Mayor Edgardo Labella asked constituents and other local government units to collect human hair, which can be used to soak up the oil that has leaked. Chicken feathers, rice straws, corn straws and coconut husks, among others, can also be used to fight the oil spill he said. “This has been proven effective. It can be recalled how effectively Guimaras Island collected human hair from all over the nation in order to contain the oil that was invading the seas,” the vice mayor said. He referred to an accident in 2006, when some 300,000 liters of oil spilled off the island in Iloilo. He said the City Government will collect hair from parlors and barbershops, while other indigenous materials will be sourced from the city’s barangays. These should be placed in nets or old stockings and leggings, to keep the materials from scattering in the water. Those who want to donate can drop these off at the municipal plaza of Cordova or the command center at the Talisay City Fish Port, Labella added. In a command conference at Cebu City Hall on Monday morning, Noel Kimmayong of Malayan Towage said the oil spill has stretched 15.9 kilometers from the accident site. Malayan is the company that 2Go tapped to address the oil spill; the latter operates the St. Thomas Aquinas passenger ferry. Based on their assessment, Kimmayong said about 25,000 liters of oil have already spilled out. The vessel was carrying 20 tons of diesel oil and 120 tons of bunker fuel. Governor Davide, for his part, said foreign firms are also coming to assist in the effort to contain the oil spill. He also said the Incident Management Team continued to invite representatives from the Philippine Span Asia Carrier Corp. (formerly Sulpicio Lines) to their daily briefings, but have yet to get a favorable response. During the PB’s session on Monday, PB Member Julian Daan reported that fishermen in Barangay Tangke, Talisay City haven’t earned anything in recent days, because people have stopped buying fish. Daan said he and Representative Gerald Anthony Gullas (Cebu, First District) gave away rice and other goods to the fisherfolks. Mayor Sitoy said the Philippine Coast Guard sent teams to remove oil from the sea in Cordova, with the help of residents and barangay officials. About 3,000 hectares of Cordova’s seawaters have been covered with oil, which has also reached the mangroves. The oil spill has affected residents of Barangays Alegria, Bangbang, Buagsong, Catarman, Cogon, Dapitan, Day-as, Gabi, Ibabao, Pilipog, Poblacion and San Miguel. Sitoy said only Gilutongan was spared. Last Sunday, an inspection team from the Bureau of Fisheries and Aquatic Resources (BFAR) saw more than a hundred dead fishes in a fish pen in Day-as. Also on Monday, Lapu-Lapu City Mayor Paz Radaza met with barangay officials to discuss measures to prevent the spread of oil slicks on the city’s coast. The City will hold a cleanup drive along the coast on Wednesday. Andy Berame, coordinator of the City Coastal Law Enforcement Task Force, said all barangays will participate in the cleanup from 6 a.m. until noon. Oil slicks were most visible in Barangays Calawisan and Canjulao, Berame said. Last Sunday, residents started laying an improvised oil sheen sweeper along the coast. Berame said the City Market Authority has been inspecting the markets to check whether marine products sold there are not contaminated. Resorts, he said, have also taken measures to prevent the spread of oil slicks on their beaches. Radaza tasked the Department of Social Welfare Services (DSWD) to come up with a list of the affected fisherfolks and provide them with relief goods. Representative Luis Gabriel Quisumbing (Cebu, Sixth District) has called on the DSWD to distribute relief goods. “As we know, many fisherfolk depend on the day’s catch to purchase their daily necessities. The interruption of their livelihood over the last few days due to the tragedy has severely compromised their ability to provide for their families,” he said in a statement. BFAR-Central Visayas Assistant Director Allan Poquita said all the barangays of Cordova town facing Cebu City are being monitored in connection with the oil spill. In a separate interview, marine biologist Mario Marababol said the habagat or southwest wind movement abetted the spread of the spilled oil. Environmental Management Bureau Regional Director William Cunado reported that a team collected water samples in four sites, for oil and grease tests. Also, 36 barrels of oil or about 7,200 liters were gathered with the assistance of Andrew Co, a treatment, storage and disposal (TSD) operator, who provided a number of empty barrels. “We will convene our TSD operators as part of the quick response in the event of an oil spill,” Cunado said.